I got the memory card reader to work so I now have some photos to share. Here are two of the sailboats in the maze regatta. They are moving along the course nicely, having crossed the starting line without penalty. Below them along the course you can just see the 'keep marker to the port' flag in red. The Starting Line is at the top of the maze...about twelve feet from the finish line. It is a long a arduous course with a variety of dangers and interesting spots. The sea seems to sparkle in many colors as the sunlight reflects off the water. And the water blends through many shades of blue. In some places, there is a slight reddish color indicating the presence of kelp beds under the water. The start of the course is marked in a sparkling sea foam green...but it disappears several feet down and it is up to the captains to figure out how to sail the maze and get to the finish line first. The race officials' blue flag hangs at the bottom of the piece to indicate the official finish to the regatta. Wondering if I still knit? I really like it. It's a simple yellow cotton scarf with rows of perle. 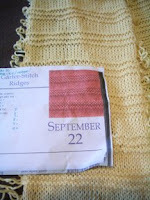 However, I just could not resist unravelling three stitches on each edge to add a fringe. I did make it shorter so as it lengthens it won't be down to my knees. It feels great around the neck...soft and warm. 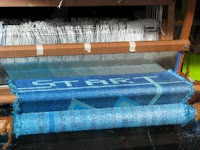 My Regatta Maze came off the loom yesterday afternoon - all 13 feet worth! Whew! What a relief. Now all I have to do is weave an eight inch by eight inch sample and I am on my way. Oh there is some finishing and final tweaking. I put the finishing and tweaking into two categories. The first is the grand tweaking - knotting and snipping the edges and ends that abound as well as removing some of the pressure lines plus a hem on the top and the bottom. These are what must be done so I can get a good photo to send the judges. The second category of tweaks are the detailed ones which could go on for weeks. There are for close up viewing. The entire piece looks fabulous. The colors are good and the small images do not pop out and distract from the maze. The downside is that it is incredibly difficult to work yourself through the maze since it is so long and the route is circuitous. I am sure a few daring souls will attempt it...but I can see it will be necessary to provide a chart showing the route for all the other viewers who get lost. ...and you say...where is the photo? ...well my camera is on vacation - off sailing in the Windward Islands...but fortunately Santa brought me a new camera guaranteed to take fabulous close ups. I took some photos of the two sail boats at the top of the maze as well as the starting line. Taking pictures was a snap! They look great. Unfortunately, I have not yet figured out how to get the pictures out of the camera onto my computer. I have tried everything on my computer...now I am off to my DH's computer...then to the memory card reader as last resort. 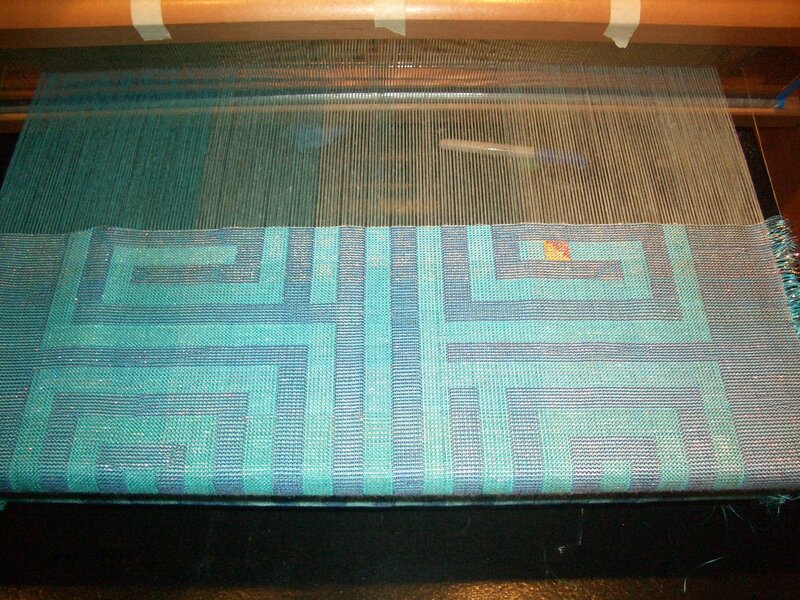 I have 68 more rows to weave in this piece...only 43 more in the maze. The rest is the header consisting of two sailboats and the starting line. Oh yes, and a hem. It is almost starting to become exciting. It's the December crunch time...the time where I must focus on weaving at least ten rows a day in order to get this piece done in time for photos, slides, samples and mailing. Today I did nineteen rows...quite a day. The biggest day yet. I have 139 more rows to do...the earlier ones are easier...the later ones more difficult. 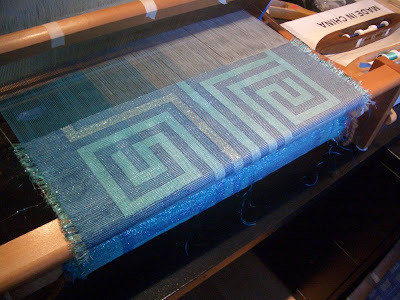 I have finished almost 6 feet of material [for context...what you see on the loom there in the photo is about five inches of yardage - the entire piece should be about 13 feet]. I am about 47% done. The small red and yellow nautical flag is the man overboard flag. I have never understood this flag. Who has enough time when there is someone overboard to hoist a flag? In all the drills I have participated in, everyone had a job to do when someone falls overboard...no one was told to hoist a flag. I neglected to take a picture of the chart symbol for kelp. It's pretty subtle as is the reddish kelp beds that I am weaving. 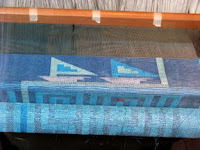 I have woven with a red and pink metallic thread with all the reddish threads underneath the navy and turquoise blues. By keeping it underneath I am hoping for a reddish sheen like the the kelp beds you see off the coast. I saw some great examples yesterday off of Malibu. There is a great deal of subtlety in this piece. I am hoping with the right light it will all come through.